Today, Tom gets up easily and walks quickly from one side of the big room to the other. Getting to this point didn’t come easy. And it didn’t come without help from homecare professionals. Tom had a team (“quad care”) of rehabilitation professionals to help him get to this point: two physical therapists, an occupational therapist and a lymphedema therapist. At first, he was a little reluctant to the therapy, Barb told us. Besides that, he was taking medications that made his mood unpredictable. After falling a few times, he was also fearful. “I call it ‘tough love,’” said Barb, his wife of 48 years and high school sweetheart. For the most part, Tom says, he’s back to where he was before the surgery. He applauds his team of VNA homecare professionals on working with him to get to this point. Ultimately, he says, rehabilitation is about education. “It’s the patient’s personal responsibility to follow through the treatment,” he says. 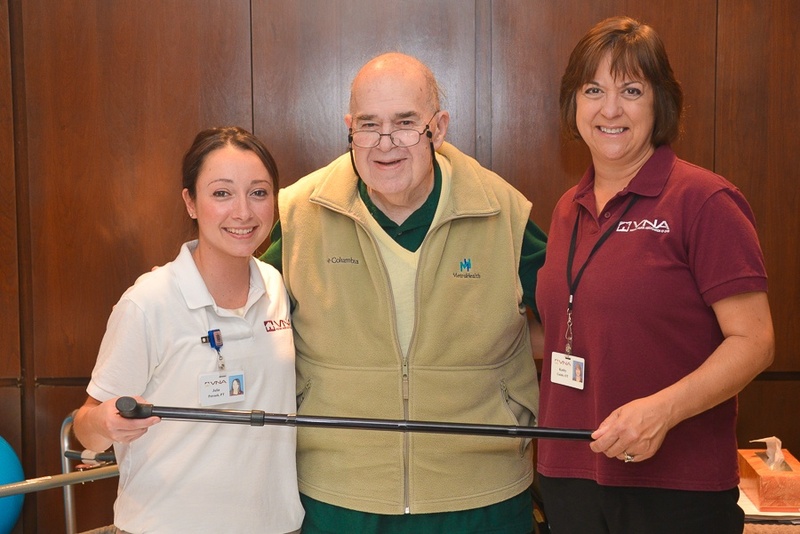 Pictured: Tom with VNA physical therapist Julie Petrash and lymphedema therapist Kathy Guido. Photo credit: Thien Nguyen. Learn more about Visiting Nurse Association of Ohio's lymphedema care and rehabilitation therapy services, or call us today at 1-877-698-6264.